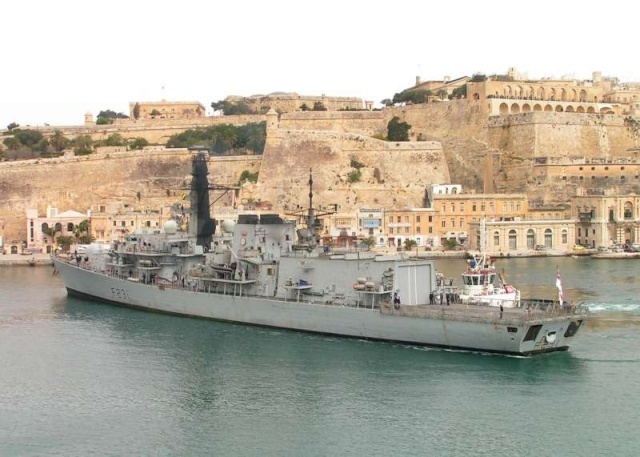 HMS Argyll (F 231) arriving at Malta in a very weathered condition on 20/03/2008. 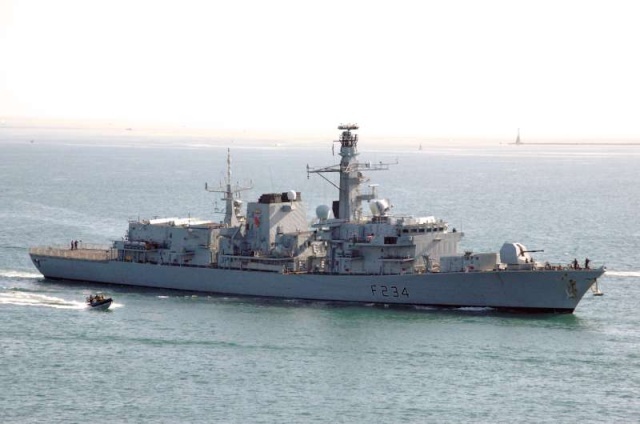 Hundreds of families and friends are expected to line the jetty to welcome the Royal Naval warship HMS Argyll home from the patrolling the Northern Arabian Gulf to HM Naval Base Devonport on Thursday (3 April). The ship is returning from six months on the frontline of British maritime operations, successfully tackling every challenge that came her way with a calm professionalism and resolve. 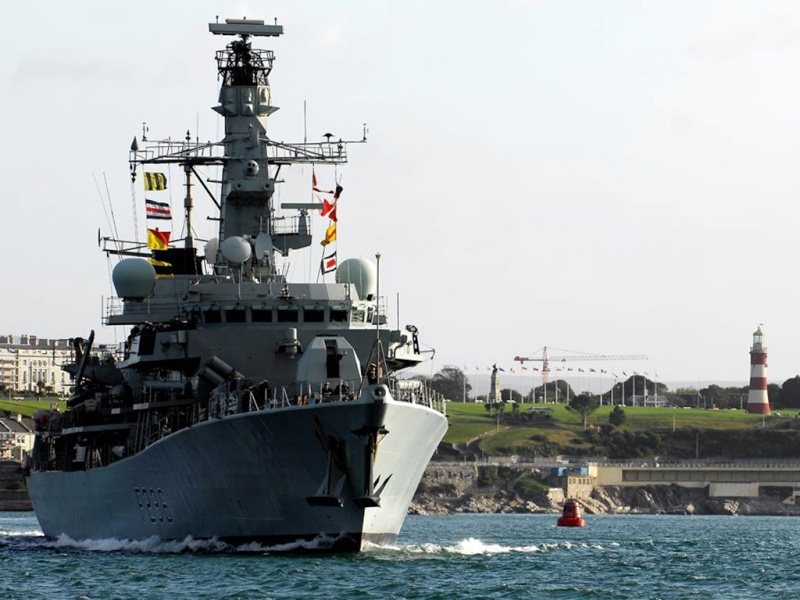 HMS Argyll’s Commanding Officer, Commander Gavin Pritchard, said: “Our return to the UK will bring to an end a professionally demanding chapter in the life of HMS Argyll. All the preparations and training conducted by the ship and the effort from everyone onboard, has made this a highly successful deployment. 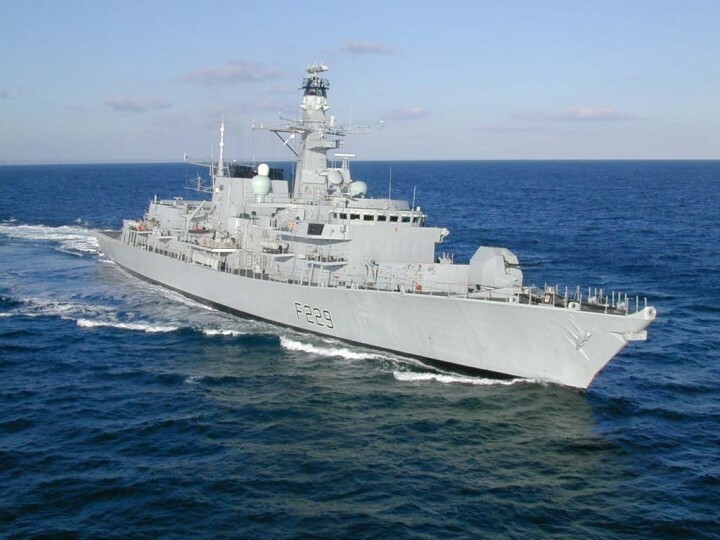 For Commander Pritchard it will also mark the end of a chapter personally as he will handover command of HMS Argyll soon after returning to the UK. 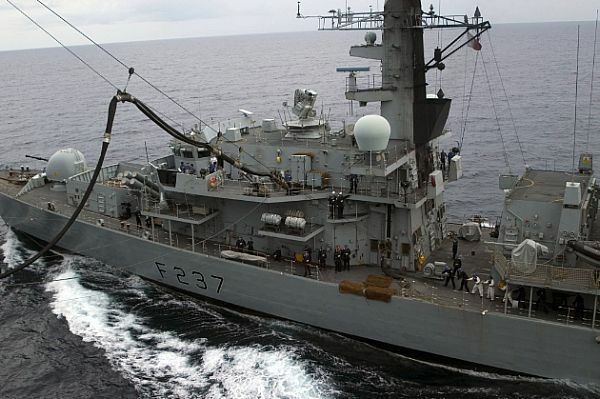 During her second Gulf deployment in three years HMS Argyll spent included 52 days in one patrol from January to March 2008. Before this, the ship had been equally busy on patrol in the Northern Gulf, forming a key part of the coalition task force assisting in the protection of Iraq’s vital oil platforms and working closely with the Australian, American and Iraqi navies to provide security for not only the oil platforms or tankers and merchantmen that ply the waters, but also the local fishermen who make a living from their daily catch. The ship’s boarding team was used regularly to provide close contact with shipping and HMS Argyll backed this up with a high tech array of sensors and communications equipment to create and maintain a good picture of shipping. The brief fuel stop in Gibraltar will also allow some family members of the Ship’s Company to embark for the last leg of the voyage. They will be able to see first hand how a modern warship works and the vital role played by everyone onboard, and the sailors onboard are looking forward to demonstrating what they can do before a well earned period of leave. After this break, the ship will be conducting exercises and training around UK waters, as well as forming part of the Meet Your Navy public displays to be held in Portsmouth in July 2008. 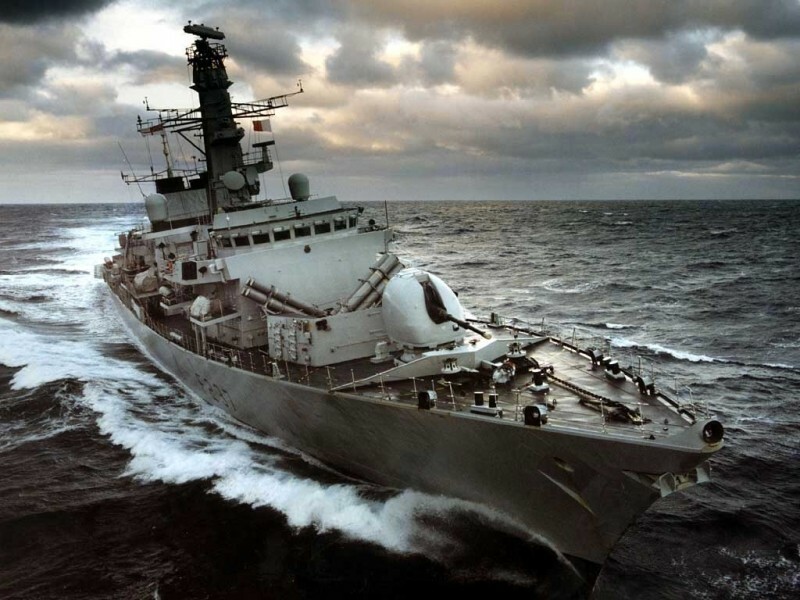 HMS Argyll is a Type 23 frigate launched in 1989. Her weapon systems include the Harpoon Anti-Ship Missile System, the Seawolf Point-Defence Missile System, Stingray torpedoes, Sea Skua missiles, a 4.5-inch Gun, 30 mm cannons and machine guns and a Lynx helicopter. Her propulsion comes from four diesel engines for cruising and 2 Spey Gas turbines for fast sprints. This gives the ship a maximum speed of 28 knots. The ship displaces 4,500 tons and is 131 metres long. She has a complement of 180 officers and sailors. 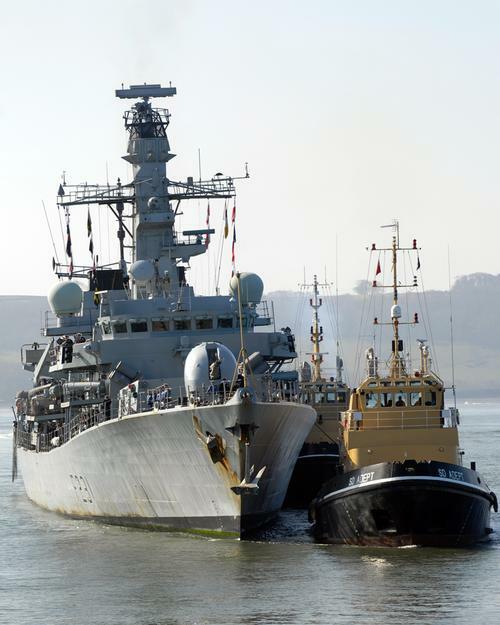 More than 500 friends and families crowded the jetty today (Thursday 3 April), ensuring a very warm welcome to the Royal Naval warship HMS Argyll home to HM Naval Base Devonport after an intensive patrol in the Northern Arabian Gulf . His daughters Victoria, 15, and Rebecca, 12, both said they missed their father and were very happy to have him back home again in Gosport, Portsmouth. He said the highlights included protecting the oil platforms and spending Christmas in Dubai. Richard joined HMS Argyll’s ship’s company in 2006 and has previously served in eight ships throughout his career. Commander Pritchard added: “Our return to the UK will bring to an end a professionally demanding chapter in the life of HMS Argyll. All the preparations and training conducted by the ship and the effort from everyone onboard, has made this a highly successful deployment. HMS Northumberland (F 238) berthed at Northumbria Quay, North Shields, North East England on 06/04/2008. 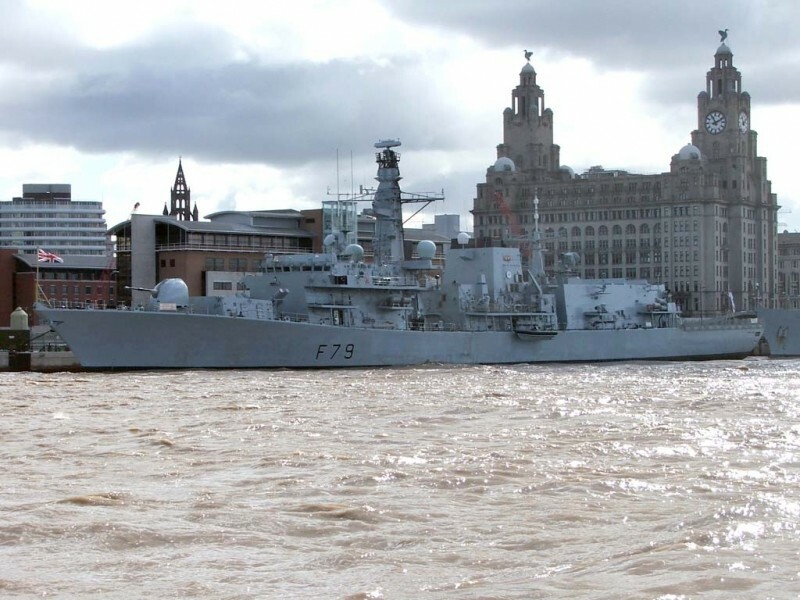 Plymouth based Royal Navy warship, HMS Portland, paid a routine visit to the city of Liverpool from the 4 – 7 Apr 08. The ship was berthed at the cruise liner terminal adjacent to the Royal Liver Building which provided a splendid backdrop for the ship. 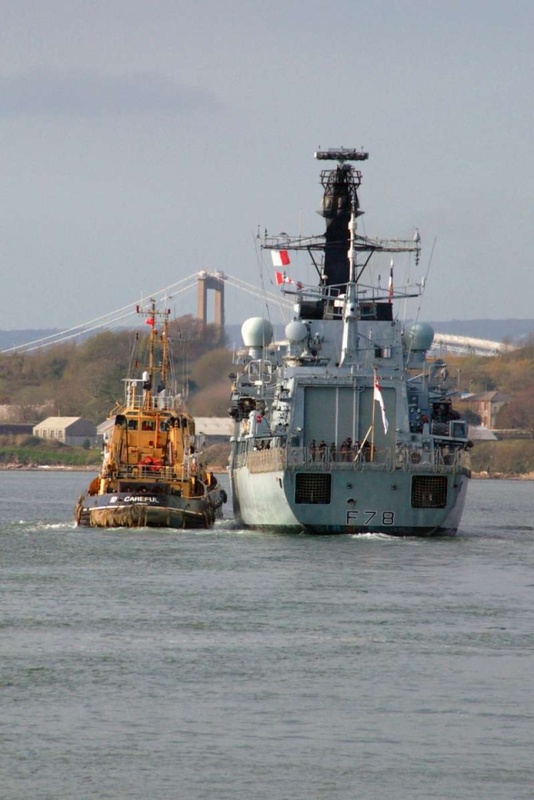 HMS Portland was joined for the visit by HMS Mersey who has strong links with the area. The ships conducted a co-ordinated entry into the port and also departed in company. The visit coincided with the Grand National Horse Racing weekend at Aintree and many members of the Ship’s Company were able to attend the races. Notably, several female members of the crew were able to attend the famous ‘Ladies Day’ and all looked very glamorous as they departed the ship in suitable attire. Other highlights of the weekend included a football match against the ‘Valentine Over the Hill Mob’ with the ship winning the fixture 3-2. The National Maritime Museum in the Albert Dock area also proved to be a popular attraction with many of the crew drawn to the nautical displays and in particular the wartime presentations. On the Sunday the ship opened to visitors and approximately 600 people braved the snow and icy winds to see what life on a Type 23 Frigate looks like. The majority of visitors were particularly interested in the bridge area where the Officers of the Watch gave demonstrations and briefs on how to navigate a modern warship. Commanding Officer, Commander Mike Utley Royal Navy, said "The ship's company have immensely enjoyed the hospitality offered by the city of Liverpool and all have had an opportunity to relax and see the city. It is important that the people of Britain get to see what their Royal Navy does and this visit provide that opportunity". 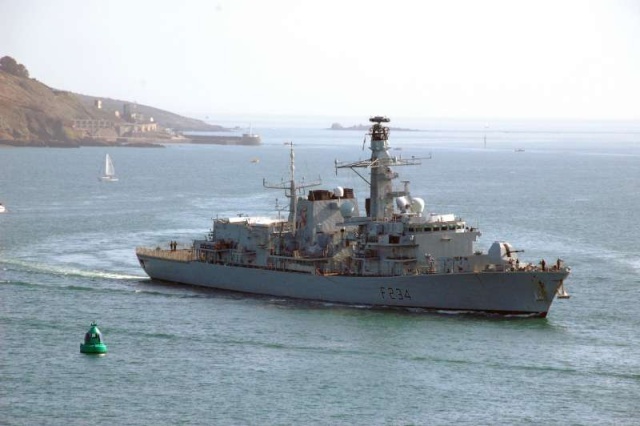 HMS Kent enjoyed time in the sun this weekend with a successful Operational Stand Off in the Channel Islands. The visit formed part of the ship’s ongoing sea training, with the emphasis on demonstrating the relevance of the modern Royal Navy to the Islanders. The visit started with over 50 local businessmen and local media embarking for a Defence Industry Day. As some of the pictures show, the guests were treated to capability demonstrations from the helicopter and seaboat, and a mocked up Air Defence exercise in the Ops Room. They also witnessed the crew conducting pilotage and firefighting before rounding off the day with some high speed manoeuvres. As it happened, Kent’s visit also coincided with the first Jersey Boat Show, so the crew threw themselves into supporting the events. Kent was certainly the largest attraction, and made an imposing backdrop to the gathered superyachts and speedboats. The Ship’s Company manned a Royal Navy stand at the show which proved to be very popular. There were also several catering efforts centred around an evening reception and CO’s lunch party. Deputy Logistics Officer Lieutenant Sharon Brown noted that she’d been delighted to see the whole ship effort which had gone into making sure these were a success. Although the reception had to be held ashore, the venue had been decorated to look suitably shipshape – complete with plastic seagulls! Weekend over, Kent now starts her final week of Operational Sea Training culminating in Final Assessment – the examination at the end of training – on Thursday. The ship has just completed another Fleet Time Support Period where important maintenance and repairs were carried out. This mainly affected the Weapon Engineering and Marine Engineering Departments. For the former, extra equipment required for the deployment was installed and the ship was ammunitioned ready for BOST (Basic Operational Sea Training) – more of that later... A good deal of work was completed by the Marine Engineering department, particularly on the ship’s Gas Turbines which allow the ship to power through the sea at up to 30 knots. The ship was sad to see Commander Moss depart and the Ship’s Company lined the upper deck to wave farewell to their old Captain as he sped past on one of Lancaster’s seaboats. We are also delighted to welcome a new Captain, Commander Bryan, who will be taking Lancaster through BOST and to her deployment in the summer. 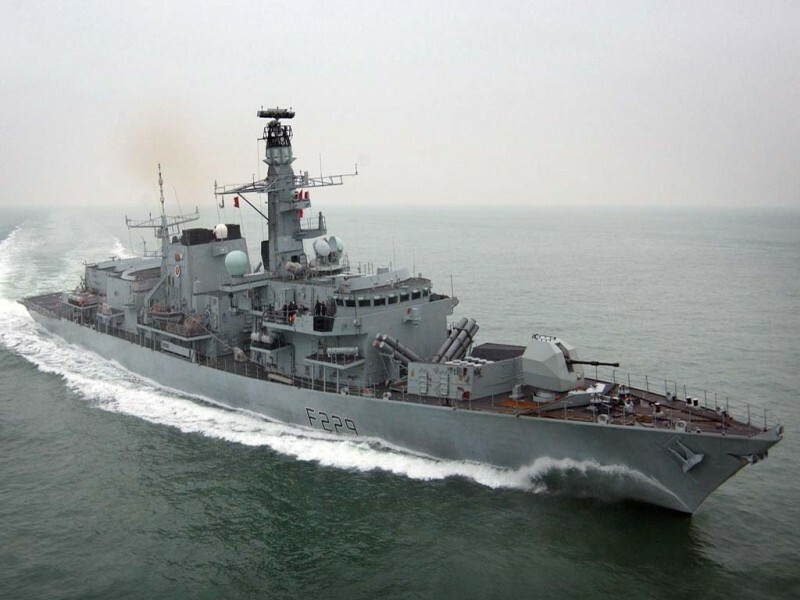 HMS Westminster has been deployed towards Burma (Myanmar) at the request of the Department for International Development. The Royal Navy Frigate, with a crew of 198 men and women has been deployed to waters offshore Burma as a contingency measure. She has not yet been formally tasked, but will be in a position to assist aid efforts if required. Her onboard facilities which could be of use include communications equipment, a medical officer and medical facilities, a Merlin helicopter which could be used for reconnaissance or to transport personnel and equipment, two sea boats and a ship’s company who are all trained in disaster relief. She has recently been on exercises in the Bay of Bengal with the French and Indian Navies. ANDAMAN SEA (MAY 24, 2008) USS Essex (LHD 2) conducts a replenishment at sea with the British frigate HMS Westminster (F237). The Essex Amphibious Ready Group is off the coast of Burma supporting a potential humanitarian assistance in the wake of Cyclone Nargis. 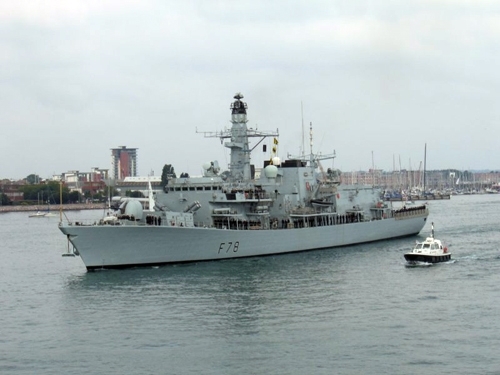 On Tuesday, HMS Iron Duke sailed from her hometown Portsmouth with an emotional send off from families and friends lining the historic seafront. The Ship is now heading towards the Caribbean for her 6 month deployment, where she will be ready to conduct humanitarian relief during the core hurricane season. The ship will also be integrated into a multi-national force conducting Counter Drugs operations in the region. During her time on operations Iron Duke will be complemented with members of the US Coast Guard who will support the Counter Drugs effort. A huge amount of hard work and effort from each and every member of the crew has gone into the preparations over the last few months. Since emerging from refit last September there has been little respite. The 8 week Operational Sea Training package was challenging and tough at times, but has bought every to the peak of their professional abilities. From fire fighting to flood control, salvage operations to terrorist attack, HMS Iron Duke is ready and whilst her deployment is focussed upon other tasks she remains at 20 days notice to conduct war fighting duties. 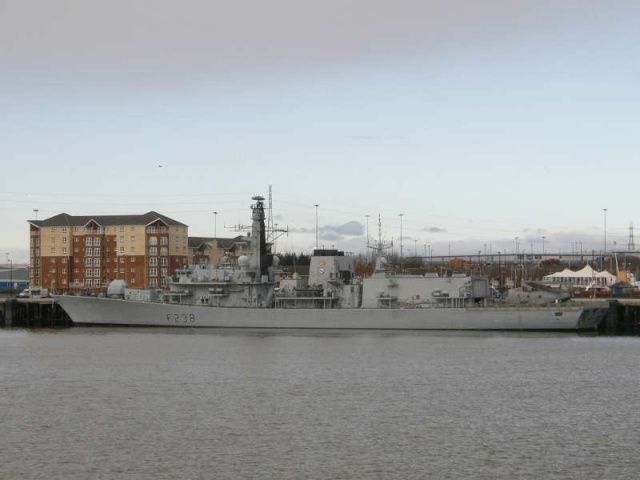 Since the end of Operational Sea Training and the visit to her affiliated City of Hull, the Ship has had a brief maintenance period alongside in her base port of Portsmouth. This has enabled all the last minute preparations to be completed but most importantly, everyone managed to get a week or two of well earned leave with their loved ones. Commanding Officer Mark Newland said ‘Emergence from the depths of refit through to deployment today has been a huge effort, my team have worked incredibly hard to achieve a excellent performance during Sea Training and I am proud that we were assessed as being amongst the best British Warships to have completed Sea Training over the past 2 years. We are now ready for the challenges of the forthcoming deployment and I for one am looking forward to it enormously. Everyone is excited about the coming deployment and the challenges that will have to be faced, many younger members of the Ship’s Company have never deployed before and are looking forward to the experience. However, for many this is a period of mixed emotions, a little sadness as the ships leaves those we care about for such a long period of time, but offset the knowledge that the Ship’s Company are trained, ready and capable of doing all that is asked of us. 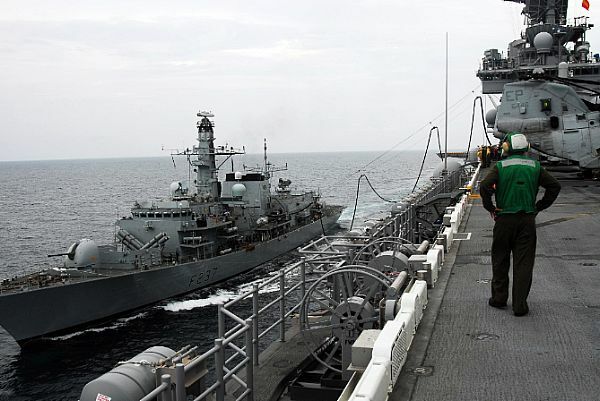 HMS Kent recently sailed for her South Asia and Far East deployment with COMPORFLOT (Commodore Cameron) embarked for the sailing. Crowds of families gathered in the sunshine on Portsmouth’s Round Tower to wave the ship off, and their cheers and shouts certainly carried clearly across to the Ship’s Company! The first day has seen the ship’s engines being put through their paces in a propulsion check, gunnery taking place to prove weapons after a period of maintenance, plus a number of exercises to prove the ship can tackle any problems which may occur. Those onboard have also begun to get into the routine of deployment including many deciding to attend additional fitness training. All this follows a week of intensive preparations – from storing the ship with everything from enough photocopier toner for six months to as much chocolate (or ‘nutty’!) as the storerooms can hold. In addition, HMS Kent also held an evening reception for her affiliates and friends of Kent since this was the last opportunity to reinforce these important links for many months. 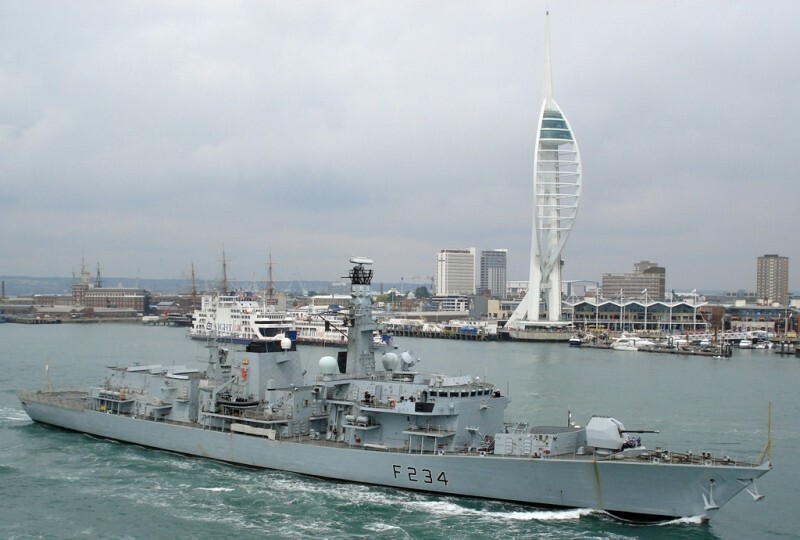 Weymouth and Portland’s inaugural Spirit of the Sea Maritime Festival will be launched on board Royal Navy warship HMS Lancaster this Friday (27 June 2008) during the Type 23 frigate’s visit to the Isle. The 4,800 tonne ship will host an official reception on board on Friday evening where the Mayor of Portland, Councillor Sandra West, and Commodore Jamie Miller, the Naval Regional Commander for the South West, will jointly open the festival by cutting a cake made specially for the occasion. The Festival, taking place from 5-13 July 2008, is designed to celebrate the area’s close relationship with the sea. It brings together a range of sporting activities, cultural events and entertainment – all on a maritime theme. The overall objective is to build the 'Spirit of the Sea' brand over the next four years and beyond so that it contributes to a lasting legacy post the London 2012 Olympic & Paralympic Games. 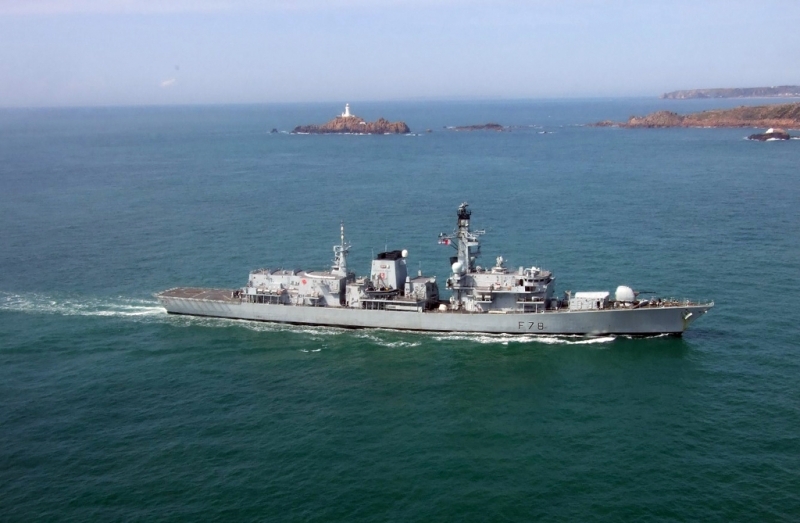 Whilst she is in Portland, HMS Lancaster will also be open to visitors on Sunday, 29 June from 12 noon to 4pm. This is a chance for visitors to learn more about life on the ocean waves and what it is like to live and work on board a warship. Admission is free. Powerful and versatile, with the capability to operate anywhere in the world, the Type 23 Frigate is the mainstay of the modern surface fleet. Originally designed for anti-submarine warfare, they have evolved into multi-purpose ships with the capability to operate anywhere in the world. They have the ability to conduct a wide range of tasks including embargo operations using boarding teams inserted from the ship's boats or helicopter, disaster relief work and surveillance operations. More than 600 families and friends braved the biting wind to welcome their loved ones home aboard HMS Montrose when the ship arrived in Plymouth this morning (Friday 3 October). 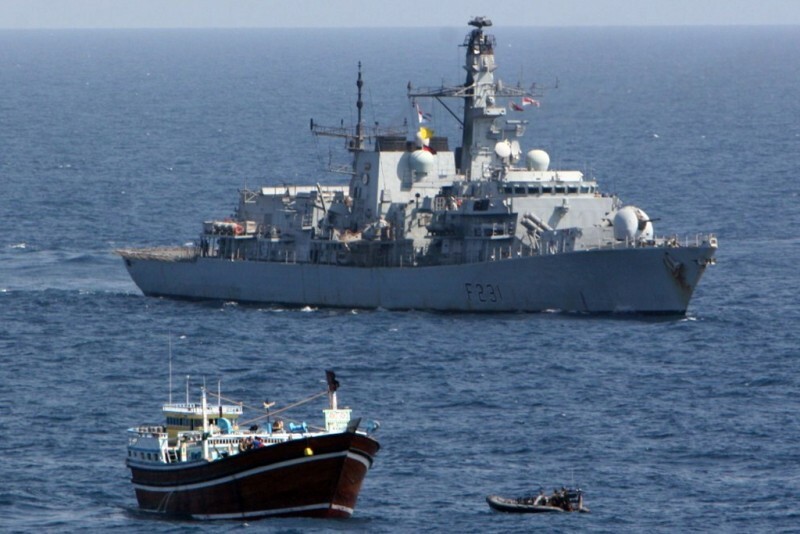 The crew of the Type 23 frigate were praised by their commanding officer Commander Andy Hogben after a successful seven-month operational deployment in the Gulf which included a ten-tonne illegal drugs seizure. The jetty at HM Naval Base, Devonport, Plymouth, was packed with a Royal Marine Band and happy families cheering and waving hand made banners greeting the crew who have been away for seven months in 40-50C heat working in arduous and difficult conditions protecting the world’s oil and other shipping from illegal activity including drugs, arms and people smuggling and piracy. The Commanding Officer, Commander Andy Hogben said: “It’s fantastic to come home to such a warm welcome. It is great to see so many families on the jetty. My ship’s company have been waiting for this moment for seven months and it more than makes up for the time away from them. I must say thank you to the families on behalf of the whole ship - without their emotional and practical support back home while we have been away in the Middle East this would have been a harder job than it already was. Commander Hogben, from Portsmouth, sailed into Devonport today with two of his three children Sam and James who embarked with his father-in-law Gavin in Spain. The CO was greeted on the jetty by his wife Julie and son Joe, age six. Commander Hogben said the ship also provided a reassuring presence working alongside the regional navies of the Gulf States to ensure maritime security in the region. The area was infamous for piracy and a merchant ship was holed by pirates armed with rocket propelled grenades while HMS Montrose was there. HMS Montrose and fellow Plymouth warship HMS Chatham, Portsmouth-based HMS Edinburgh and the Royal Fleet Auxiliary ship Argus (with Sea King helicopters on board) were jointly involved in the successful anti-drug smuggling operations amounting to 23 tonnes seized due to Royal Naval interceptions over a five-month period earlier this year. 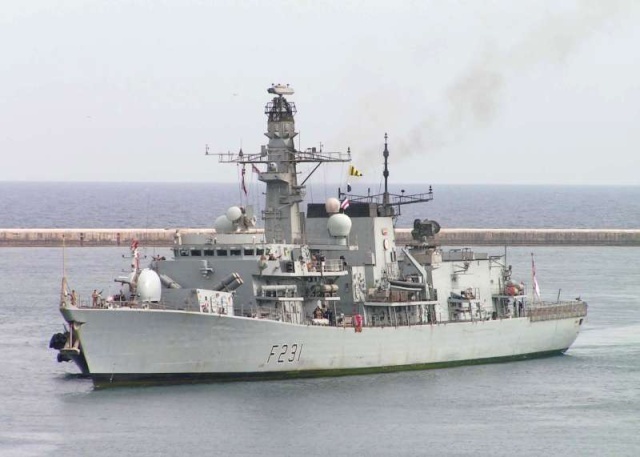 Plymouth-based HMS Northumberland has temporarily taken over from HMS Montrose in the region. After well-deserved leave the crew will return and deliver the ship to Rosyth in November for upkeep maintenance. The ship has been on four deployments in four years.